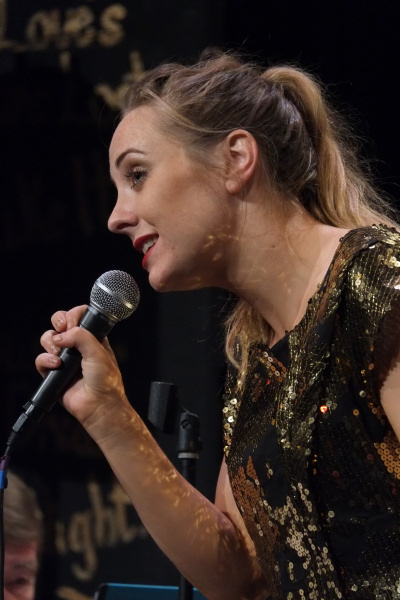 Forsaking the Wimbledon finals the jazz faithfull of Newport Jazz Club on Sunday gave a rousing welcome to vocalist Sinead McCabe and the Cass Caswell Trio. Sinead made her Isle of Wight concert debut last year having shortly before been working in a coffee shop having never sung in public. Since then she has gone from strength to strength on the south west circuit and started with an advantage having made several recent festival appearances before winning over the audience in two straight sets. Featuring numbers largely made famous by lady vocalists the audience was taken on a journey from 1913’s “The old rugged cross” which started life as an evangelical number before being adopted as a jazz standard. Highlights were “Nobody Knows You When You’re Down and Out” popularized by Bessie Smith in the 1920’s and a slow and emotive rendition of “The House of the Rising Sun ”. With a 23 number set Sinead kept the audience enthralled throughout and the musical journey took the audience through the decades through until the 1970’s. With Cass leading the Trio on upright bass he was supported by the former musical director of Scottish Television, John Martin, on piano with Eddie John, who has played with most of the UK jazz greats including Acker Bilk, on drums.